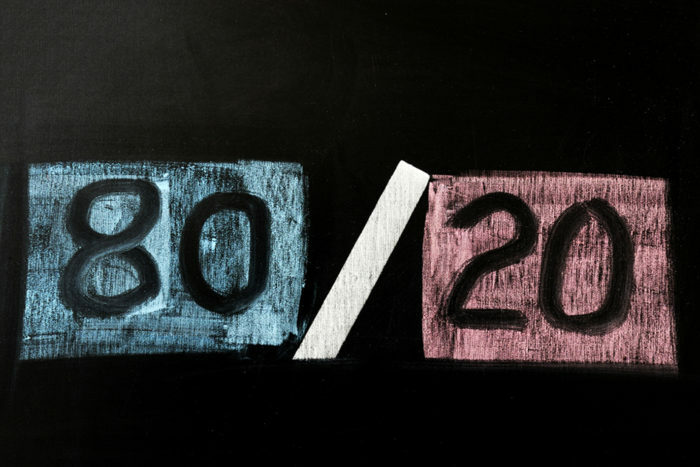 Most people have heard of the 80/20 rule, or as it’s more formally known, Pareto’s Principle. Vilfredo Pareto was an Italian economist who first noted the 80/20 connection at the University of Lausanne in 1896. He showed that 20% of the pea plants in his garden produced 80% of the healthy pea pods and also discovered that 80% of the land in Italy was owned by 20% of the population. In 1997 Richard Koch published the 80/20 Principle which, while selling more than a million copies and being translated into 35 languages, went on to show how the Pareto Principle applied to many areas of life. It could be shown to be true in everything from business to careers to nature to personal happiness. Simply stated the principle shows that 80% of results will come from 20% of the actions. I’m betting that 20% of the employees at your work are responsible for 80% of your company results. I have ten hiring managers I work with on a regular basis. I know who I get the best results with. You guessed it, two of them. Typically 20% of employee’s take up 80% of HR’s time and energy. Also known as the squeaky wheel. I’ve been a lifelong fitness enthusiast. I mix up my workouts every three to four months. What I’ve found is even though I change my routines, I get most of my best results from 20% of the exercises I do. I have about 20 friends in my life that I do things with over the course of a given year. If I’m honest, there are five of them I get along with, and we do a lot of things together. Yup, that’s 20%. 80% of the earth’s mineral wealth is produced by less than 20% of the earth’s surface. You probably wear 20% of your entire wardrobe over and over. We all have time draining tasks such as emails to respond to. Create templates for emails used on a regular basis and prioritize responding quickly to the people that help you achieve the most. Don’t sweat the others as much. Identify the top 20% of your actions that yield the most significant results (such as your best sourcing techniques) and time block to spend more time on that. Spend more time with the 20% of people at work that helps you achieve the most. Spend less time with those that vacuum your precious time. Identity the top impact activities and spend more time on that. For me, it’s sourcing and recruiting high-level sales talent, so I make sure to spend as much time as possible on that. Conversely, spend less time on “low yield” activities that you find yourself doing that isn’t helping you much. For me, I find these actions to be things I wind up doing in a trance, such as scanning too many resumes. When possible always spend time on what I consider to be the most critical – relationships. Spend time with people that I enjoy being around, less time on those I don’t. Health is vital – find time in every day to exercise on some level. I get enough screen time at work; I minimize this (phone) when with people. Eliminate negativity. This applies to not spending too much time on the depressing news to not allowing myself to be cornered by my “woe is me” friend when out for an evening with friends. Employing the 80/20 in your life can be both an eye-opening and game-changing experience. Bottom line is we are all busy, and we all have the same 24 hours in a day. It’s incredible the amount of busywork and redundancy that chips away at our time on a daily basis that doesn’t do anything meaningful. Carve out two hours of your life and take a look at how the 80/20 rule applies to your life, especially at work. Once you identify the 20% of the activities that yield the best results and provide you with the most satisfaction, start working towards making that a reality. You’ll be pleasantly surprised. If you think about it the 80-20 rule really applies to a lot of things in our lives. I never thought it too much until I read your article. And although it doesn’t apply to everything I have to admit now that I am thinking about it, it comes pretty close to many of them. If we could manage to turn this rule into a productive everyday cycle it can really be life changing. I will think into this more now that you brought it to my attention. Thank you. Glad you enjoyed the article Stratos. It really can apply to just about any part of your life you’d like it to. It’s eye opening. It’s amazing how the 80/20 rule applies in most aspect of our lives. I have always held about this rule but have not really applied it to any part of my life. We spend a lot of our times doing things that don’t really give us results. If we should focus on the little that is actually giving us result we would be able to achieve more than we previously did. Seriously the 80/20 rule is very important and those that are able to realize this would be able to apply it in their lives and almost immediately start to see the result of following that simple but important rule. This is something I would need to start making use of in my life because I for one know just how important it is. Thanks for stopping by Jay. It really is amazing how much you can apply the 80/20 rule to so many things in our lives!